My girls have loved puzzles from an early age. 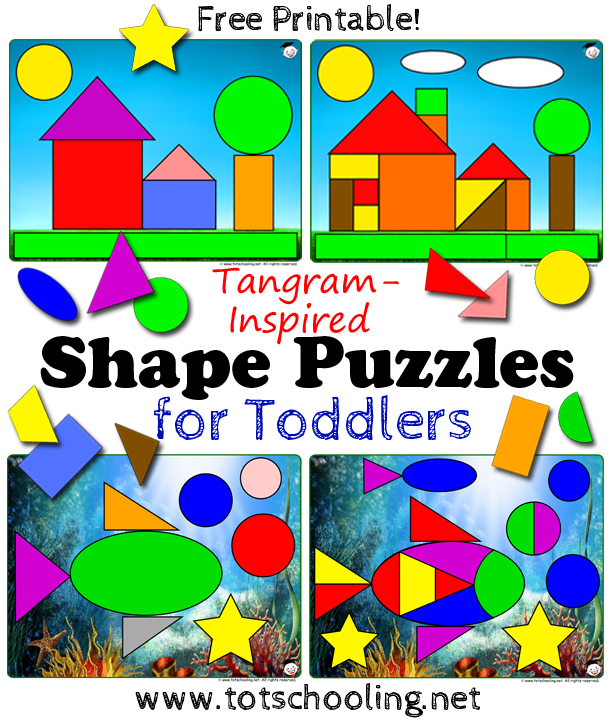 When my first daughter was a toddler, I created these Tangram-inspired matching shape puzzles for her to practice shapes, colors and spatial skills in an easy, toddler-friendly way. Tangrams are traditional Chinese puzzles made from a square that is divided into seven shapes. These shapes are rotated, moved and arranged to create specific forms and figures using all seven pieces. Tangrams are very good for critical thinking and spatial reasoning skills. They're a lot of fun for kids of all ages! The printable puzzles that I created come in 2 difficulty levels. For younger toddlers (around 18-24 months), there are fewer pieces to match and the design is simpler. 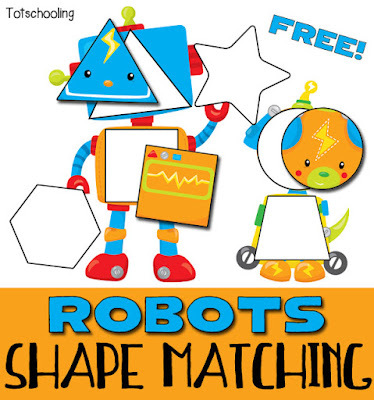 The shapes and colors are independent from each other, so the child can match either by color or by shape. For older toddlers (around 24-36 months), there is another level of difficulty as they have to match the shape, size and color at the same time. Some shapes are the same size but different colors and others are the same color but different sizes. As with most of my toddler printables, I recommend that you laminate the sheets & use velcro dots so that you have a durable and reusable puzzle that your child can do over and over again, and you can use with future children. Note: Some of the pieces in the more advanced puzzles are fairly small, so always use under adult supervision. After laminating and cutting out the shapes, some of the corners may be sharp (particularly the triangles) so I recommend cutting off the corners. These are so much fun! Thank you for sharing at Kids Learning Printables! I will be posting these on Facebook and will happily share on Pinterest! I LOVE this idea -- I'm so glad you linked this up to The Thoughtful Spot! I'm going to print it out and use it with Maeve!